This is an elegant and very easy entrée for serving at a dinner party or a date night at home. Scallops have a wonderful buttery flavor. Lemon Infused Extra Virgin Olive Oil is being used and can be purchased on-line at Spicewood Food Company. Ingredient amounts serves two people, adjust ingredient amounts to accommodate the number of people eating. Keep in mind that sea scallops are quite large and three is a nice serving for one person. Cook pasta per package instructions while preparing scallops. Wash scallops, pat dry and season both sides with salt and pepper. In a large skillet add butter and oil and melt butter over medium high heat. Add the scallops and cover. Cook on first side for about 4 minutes, flip and cover. Cook second side for another 4 minutes. Scallops should be nicely browned and translucent in the middle. Cooking times for the scallops will vary depending on the size of the scallop. Taste sauce and add more salt if desired. 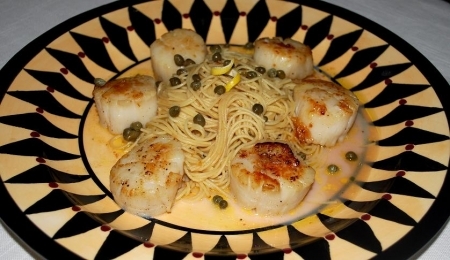 Drain pasta, plate, add scallops, pour sauce over pasta and scallops and top with capers. If desired melt extra butter for dipping scallops. Try Villa Maria Chardonnay Private Bin Vintage 2002 (Marlborough New Zealand), Wente Vineyards Riva Ranch Chardonnay Vintage 2007 (Livermore Valley), Brancott Vineyards Marlborough Sauvignon Blanc Vintage 2007 (New Zealand), Schoffit Alsace Chasselas Vieilles Vignes Vintage 2006 (France), Paulaner Hefe-Weizen (Germany) with a lemon wedge or Franziskaner Hefe-Weisse (Germany) with a lemon wedge.